It seems a long time since I had a chance to write! Life is always an adventure, and at times things take on a life of their own. So it has been at Brick House Fabrics. But, we are back, from outer space, as it were! this day is always special. always sending a pot full of red tulips to my mother on this day. The smell of fresh tulips always reminds me of him. While seeming lost in outer space a lot has been happening at Brick House Fabrics. We have been getting many of the new fabrics in from Europe. We are importing these ourselves, to widen the choice of fabrics available. It has been a true adventure to see what other countries are producing. It is always exciting to see the new fabrics. A sample just is not the same as the real thing. These fabrics arrived tied with ribbons- only the French would do that! Notice the height on some of the bolts- they are a extra wide, giving 12% more fabric per yard than the average bolt of 56″. 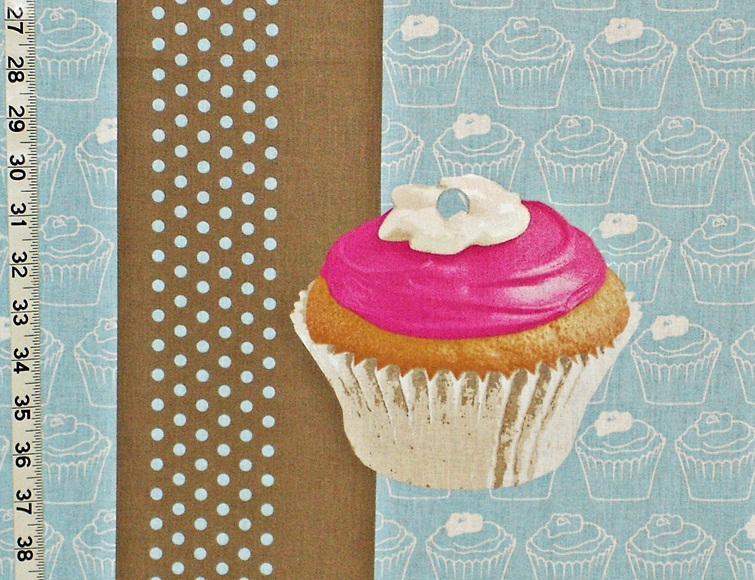 This cupcake fabric has a background of rows of toile cupcakes on sky blue with an additional overlay of cocoa with blue polka dots, and then the most luscious cakes going over that! This is sheeting weight. 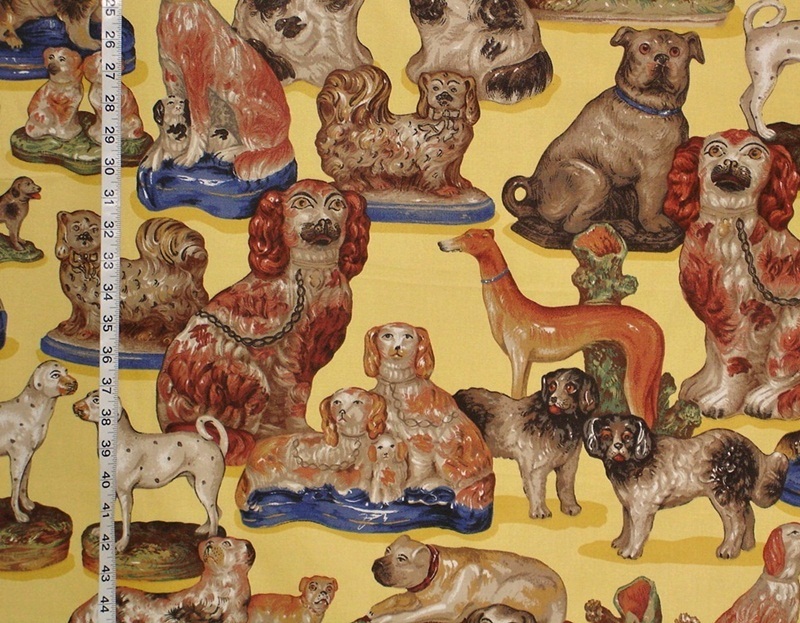 It is perfect for curtains, cushions, or quilts! And, it is extra wide at 64″- about 12% more fabric per yard! There are two yards left of this fabric. Just listed are two small pieces, enough for pillows, and an end of bolt piece. This is long out of print, and when it is gone, that is the end of it. A popular pattern, we are sad to see it go. 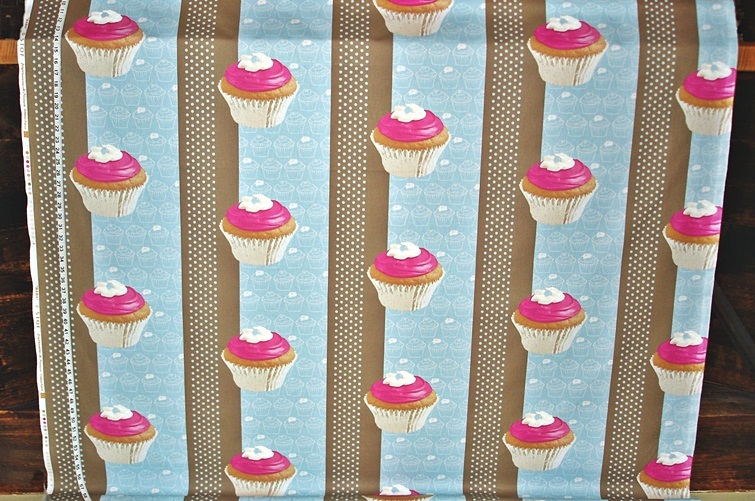 There are two yards left of this discontinued fabric. A small piece has been listed as destash, and there is one more piece that will go on tomorrow. 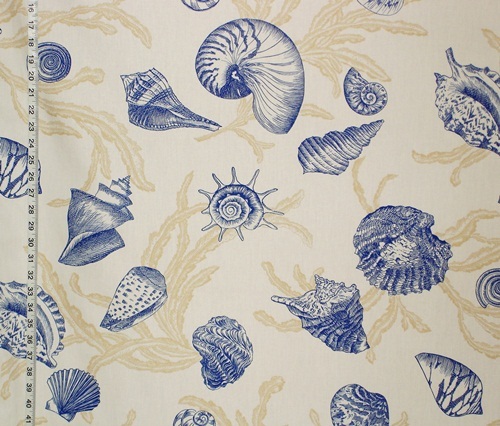 This blue toile seashell fabric always intrigued me with the shells grouped around a sun shell, like planets around the sun. The float of seaweed behind the shells gives it depth. 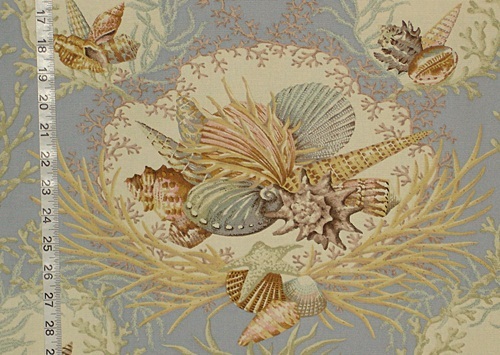 The blue medalions seashell with seahorses and coral, the aqua medalion seashell with seahorse and coral. These have been a staple here, but are being dropped. Get them while you can! A small piece of the blue medalion has been listed as destash. 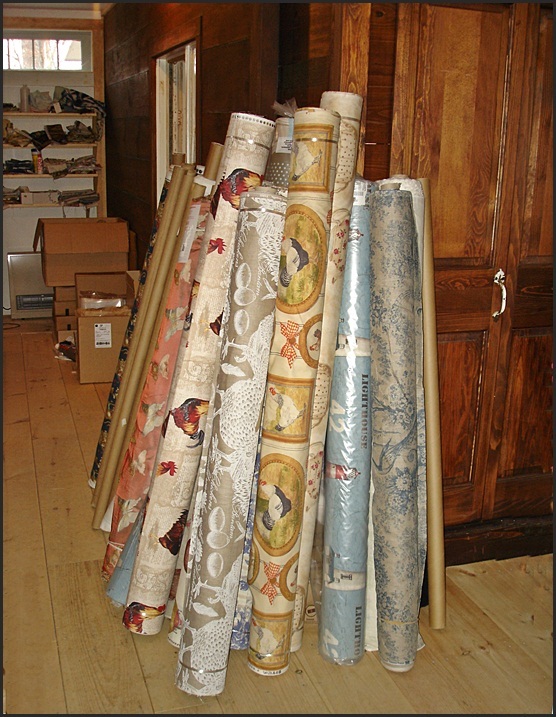 New fabrics from Europe just arrived… time to unpack them. We will get them pictured and listed as soon as possible. Have a wonderful Valentine’s evening with a loved one! 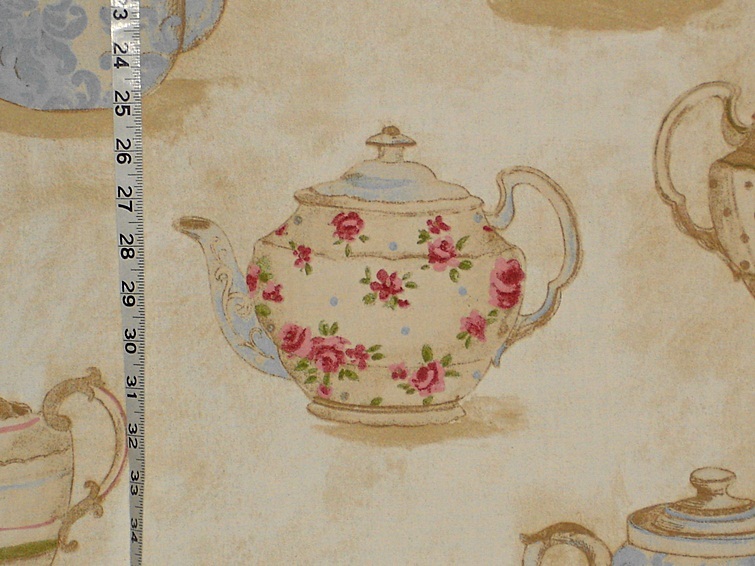 Teapot fabrics have been in short supply in the last few years. We finally found one in Europe! 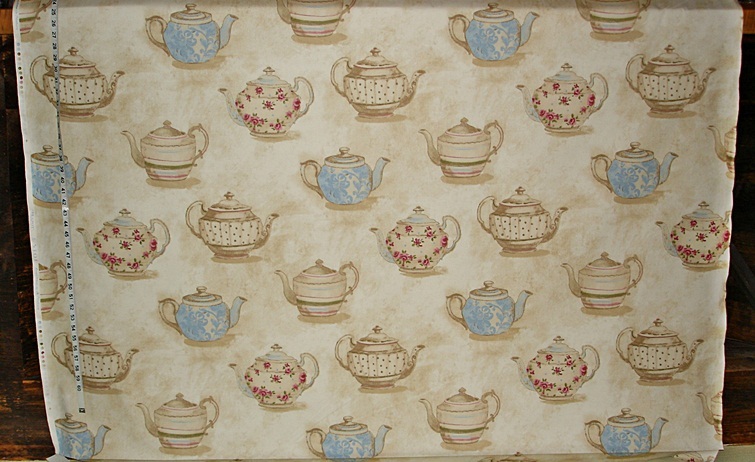 A rather funky, cottage looking teapot fabric, it definitely has a vintage look.